Well, here we go again! It’s the year 2020, man has trashed the planet, and the only hope is undersea labs run by big evil corporations! If that sounds like the set up for producer Roger Corman‘s Lords Of The Deep to you, then you are not only correct, but also have my sympathies for apparently having been subjected to that waterlogged abomination. But Roger is all about second chances! Because a second chance costs half as much as an all new first chance! Thus, this not very intriguing or original premise is also the jumping off point for another of his company’s movies, Unknown Origin. There’s only so many great ideas floating around, so it’s understandable that every so often you’re going to have recycle a story here or there. 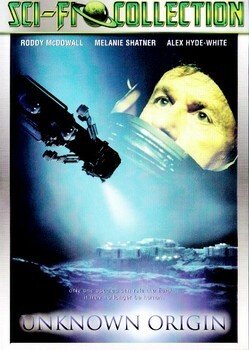 This is especially true in one of our most cherished genres, the “underwater version of Alien” genre. Movies like Deepstar Six, Leviathan, and Endless Descent are favorites because not only do you get plenty of gory deaths from icky creatures, but also because it all takes place right here on planet Earth! This ups the suspense because it’s a lot easier to believe that terribly deformed bloodthirsty creatures are rampaging around a super secret advanced lab that’s been constructed at the deepest part of the ocean for some usually vague mining reason than it is to buy that it’s all happening on a spaceship! A spaceship? That’s science fiction! Undersea labs are basically submarines that are parked! That’s science fact! 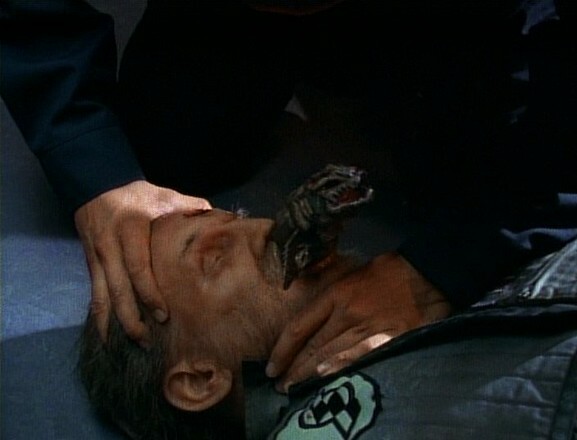 In keeping with the movie’s theory that we can’t continue to plunder our nation’s non-renewable resources, Corman leads by example by re-positioning some of his favorite footage from Lords Of The Deep into Unknown Origin! Pretty much all the exterior shots of the undersea lab as well as the scenes of the lab’s subs moving here and there were first seen in Lords Of The Deep. There’s also probably some footage from other Corman movies inserted as well. There is at least a shot of an explosion in a shaft that was also seen in Star Hunter and The Terror Within. None of that is particularly shocking or off-putting since we’ve seen that sort of thing done before in movies like Ultra Warrior. Despite Unknown Origin not having the sheer quantity of re-used scenes as a movie like Ultra Warrior, Corman still turns it up a notch and does something I’ve never seen before in a movie – he uses the same opening text that describes the plight of earth in 2020 as he did in Lords Of The Deep! I urge you though to ride it out because Corman takes everything that was wrong about Lords Of The Deep (everything) and changes it! I was going to say that he fixed it, but replacing a surly Bradford Dillman as the lab commander with a surly Alex Hyde-White was not exactly an upgrade. 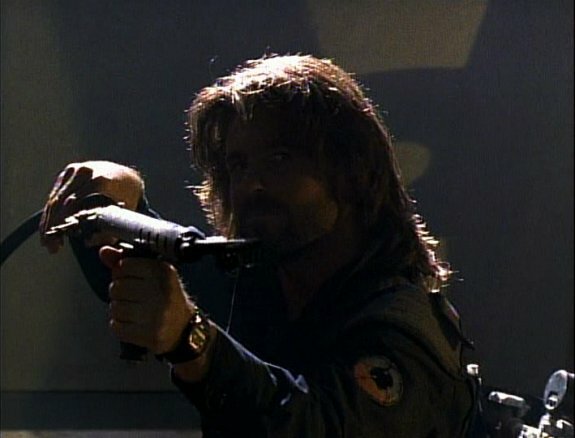 To Alex’s credit, he does spend most of the movie threatening his crew and pulling a gun on them while forcing them to suffocate to prove they aren’t possessed by an alien parasite. Besides, it wasn’t like he didn’t take his suffocation first. It’s called leading by example. The story of Unknown Origin is just the sort of story we were wishing for while enduring Lords Of The Deep. Gone are the pansy aliens who want to tell us how to save our planet and spend all their brain power communicating with a perpetually stupefied looking Priscilla Barnes. In their place are nasty little lizard-rat-like parasites that crawl into your mouth and slap pinkish tentacles all around your head! And the only to way to destroy them? Burning! You know what that means! Time to hit the mining supply depot and load up on the flame throwers! The stuntmen who specialize in burn scenes get a nice workout in this movie as there are at least three guys who get burned alive! That was a smart choice for this movie because in these undersea movies you aren’t able to blow up cars and watching models of subs and labs explode doesn’t give you the same kind of rush. Guys engulfed by flames and writing around on the floor though? Always appreciated! The parasites are brought over accidentally when the crew investigates a distress call from an underwater Russian mining facility. The Russians uncovered the aliens while digging under the sea and once the parasites were on the loose, everyone went crazy and killed each other. Despite not knowing the cause of death, the dead bodies are brought aboard for examination as is a survivor. Naturally, he’s infected and the corpses are harboring parasite eggs. It’s true that the super powers the parasites exhibit are never fully explained. Like how they can avoid almost all detection despite being a big lizardy thing that’s moving around inside a body. And yes, they somehow can possess a person, commanding them to do whatever nefarious bidding they can think of. And really, isn’t it obvious that they’d also have a dose of that super strength all parasitic reptiles are renowned for? But who really cares about some monster’s dubious resume so long as there’s 75 minutes of shooting, burning, accusations, and a lab with a self destruct sequence! It even has an android in it along with a shady doctor who has his own agenda! Unknown Origin is what Lords Of the Deep should have been, which admittedly wasn’t a hell of a lot, but still, I’ll gladly trade slimy parasites with unexplained powers for preachy manta rays too stupid to communicate with anyone other than one of the gals from Three’s Company!